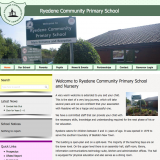 Ryedene Community Primary School and Nursery. Ryedene caters for children between 3 and 11 years of age. It was opened in 1979 to serve the southern boundary of Basildon New Town.